Outdoor kitchens make dining al fresco at home more appealing than ever. A rebounding trend in outdoor living reveals more and more properties feature outdoor kitchens that once were the province of only the very wealthy. Today, moving the home’s indoor central meeting place outdoors creates an open-air living space that’s both accessible and inviting as any indoor room. Great for gatherings and socializing, having a kitchen and dining area outdoors also eliminates some of the indoor mess and hassle of food preparation and makes for a more inclusive cooking experience. You can create outdoor living space that is an organic part of your yard or a discrete, open-air self-standing room or suite for your home. With features ranging from simple and functional to more extravagant, an outdoor kitchen investment comes with a return that’s at least equal to a major kitchen remodel – 80 percent or more. Talk to your real estate agent about the return on your investment in an outdoor kitchen in your specific neighborhood. If you are enterprising, hands-on and have budget constraints, you can put ideas into play yourself. If you need a truly professional look, hire a contractor to design and build the area. Durability is paramount for any outdoor appliance and should be a primary concern, especially if you live in a harsh climate (cold, wet, dry or hot), even if you cover your appliances in inclement weather. Cooking fuels are commonly gas or charcoal, but outdoor kitchens can incorporate a wood-burning oven, outdoor fireplace, or a fire pit. 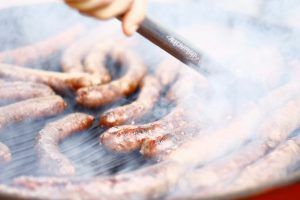 Barbecue fans might opt to include a smoker or mesquite grill. Higher end outdoor kitchens often include ample counter top space, drawers and cabinets for storage, as well as a sink, and refrigeration. Existing utility connections could narrow your choices, but you can run a natural gas line to the outdoor kitchen. Adequate plumbing pressure is a must in order to accommodate hot and cold running water. The living space that frames your appliances helps set the tone for outdoor living. If you have an existing deck or patio, you could develop that space into a living area. If you install an island and bar area with stools or opt for a simple outdoor dining set, consider protecting your space from the elements, just as you would your appliances. 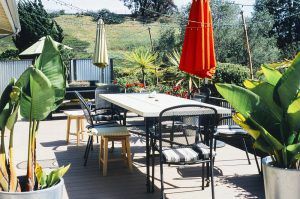 Some kitchens incorporate a roof, covered archway or pergola; others could need only an ample patio umbrella to also protect diners from weather. Special roofs and over coverings can allow you to cook outdoors year round – even in inclement weather. To build functionality into your outdoor kitchen, consider the flow of space just as you would your indoor entertaining areas. Keep your cooking area accessible to your indoor kitchen, when possible, to experience less running around with dishes and ingredients you keep inside the home. Put seating near your cooking area, but not so near as to interrupt the flow of the chef. Keep lighting in mind when it comes to evenings. It’s a lovely time to relax outside after the sun goes down, and inviting lighting enhances the experience. 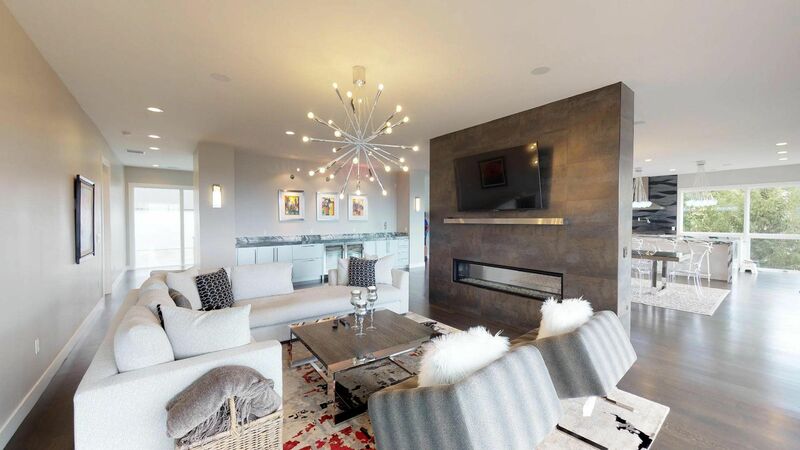 Create a mood with built in lighting and strands of hanging lights. Gas and traditional tiki torches are an option that maintains that outdoorsy atmosphere. Overall, the design of your outdoor kitchen should compliment your home, especially adjacent areas.